Nick's Bump is a cocktail, a vibe, and an excuse for a party. The vibe? That's in the music, classics from Eddie Harris, Sonny Clark, Lee Morgan and more, all played studio live. ENHANCED CD. Jazz has always been about a party - "Having fun in spite of conditions," as saxophonist Johnny Griffin once said. It's originally and essentially street music, music that comes from the bars, the clubs, the corners where people hang out and share the news, "wash away the dust of everyday life," (Art Blakey said that.). In that social space, during the social time, a lot of magic can happen. And of course, from time to time, people in that frame of mind will have a drink. Nick's Bump is our drink of choice. In the classic tradition of the fifties and sixties, when groups like Benny Golson's Jazztet and Art Blakey's Jazz Messengers would stay on the road perfecting their music before recording it, the Nick's Bump Band road tested this music through two years of touring in Europe, Japan and the United States. Nick's Bump, then, is a metaphor as well as a drink. It stands for having a good time, playing music, in the words of Horace Silver, that makes you wanna "pat your feet, pop your fingers, and shake...whatever else you want to shake." The songs, too, come from the halcyon days of groove jazz -- Lee Morgan's "Zambia", Eddie Harris' "Mean Greens" and Sonny Clark's "Blue Minor" to mention a few -- and are brought up to date through the production and recording technology of the great Hector Coulon. "Coulon understands the past and is hands on with the future," says Sidran, commenting on Coulon's drum-centric mixes and his skillful blending of the wisdom of Art Blakey and Dizzy Gillespie, captured via audio excerpts from Sidran's own enormous stockpile of jazz interviews. These interviews, collected over ten years, from 1981 through 1990, when Sidran was the host of National Public Radio's Jazz Alive! And Sidran on Record, will one day be released as a series of "Talking Jazz" CDs, conversations with many jazz greats, but they make their public debut here onNick's Bump. 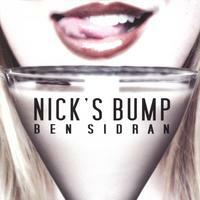 Nick's Bump finds Ben Sidran returning to his roots on the Wurlitzer electric piano and Hammond B-3 organ, instruments he helped popularize during the early seventies with his recordings for the Blue Thumb and Arista labels, classic sides that were heard on jazz and rock stations across the country. Over the years, several of those early sides have been sampled by groups like Cash Money Clique and rappers like France's MC Solar. Also featured in the band are saxophonist Bob Rockwell, 2003 recipient of Denmark's coveted Ben Webster award, bassist Billy Peterson, drummer Leo Sidran, and guitarist Louka Patenaude. "The feeling we captured in two intense days of recording is exactly what we were after," says the elder Sidran. "If there is a lesson in this experience -- and why not? -- it is that, in the words of Art Blakey, the purpose of this music is to 'wash away the dust of everyday life.'" To that end, Sidran shares the secret of Nick's Bump on an extended video included with the CD, which shows how to make the exotic cocktail of the same name. "Everywhere we play, people love to enjoy themselves and we love to make them happy. Finally, we put it on record." Nick's Bump is a cocktail, a vibe, and an excuse for a party. The recipe for the drink is below. If you have a computer, insert the CD and learn even more about how to "get bumped." The vibe? That's in the music, classics from Eddie Harris, Sonny Clark, Lee Morgan and more, all played studio live with no alterations, except for what the great Hector Coulon brought to the party. The party? That's in the band, a group of musical brothers who have traveled thousands of miles to bring you the good news. Art Blakey says at the top of "Black Jack," "its got to be love, and its got to be right!" This music is all about enjoying yourself, and, as Dizzy Gillespie tells us (in "Listen Here,") "you can work that!" We're working. Bottoms Up! the music was excellent, but I missed ben's voice, I love the way he sings, the cd was in perfect condition, toni loves cd baby, thank you so much for your kind and excellent service! If you don't dig soul jazz after a taste of this ,check your soul cause it might have a hole.